Oh, you haven’t been introduced? Allow me the honor. What’s it for? Vascular procedures. Under ultrasound, the needle is introduced into the vessel. The small wire is passed down the needle by usual Seldinger technique, and the needle removed. The dilator/sheath is railroaded over the wire (to the hub, or at least fairly deep). The central stiffening trochar is unlocked, and is removed simultaneously with the wire, leaving the sheath in the vessel. This sheath is large enough to pass the full-sized wire from, say, a central line kit. By doing so and removing the sheath, you can then place the full sized dilator and introduce your line in the usual fashion. The result is essentially the normal Seldinger technique, with an additional step involving upsizing from a miniature needle and wire. What’s the point? Well, the conventional approach requires making your initial stick with an introducer needle large enough to pass your full-sized wire. While this needle is not “big” in the grand scheme of things, in certain patients with tricky anatomy or coagulopathies, it’s bigger than you’d like. By starting with an extremely small needle, essentially no bigger than the one you’d use to infiltrate lidocaine, you limit the harm if you perforate something unintentionally — such as arteries or lungs. But it’s more than that. The micropuncture set is a subtle, sophisticated device allowing finely detailed work by an expert operator. Compared to the crude introducer needle, it is an artist’s paintbrush. If a skilled user is facing down a challenging vascular procedure, an ultrasound probe should be in one hand, but a micropuncture needle should be in the other. It’s the lightsaber to a blaster, the bougie to a styletted tube, and the TEG to an INR. Here are a few of the ways it can make your life easier. What’s a safe INR, PTT, or platelet count to place a central or arterial line? In the interventional radiology setting, this is a question with answers — albeit fairly arbitrary ones — but in the critical care world, patients who need lines often need them despite being sick, if not as a direct consequence of it. However, the safety of such a procedures can be optimized. Of course the most experienced operator should perform it, and should use ultrasound guidance. Site selection should be thoughtful, although as we’ve discussed before, the subclavian vein may remain on the table. Use a single-puncture technique, and maintain excellent visualization of your needle tip, preventing soft tissue trauma or backwalling of the vessel. Finally, use a micropuncture set. While this will not reduce incidental bleeding per se — that’s what your other good practices are for — it provides a safety net. If you screw up and make a hole where you didn’t mean to, the hole will be tiny, and unlikely to result in serious complications. A note: while the needle and wire are small, this adds no safety if you stick the wrong vessel (e.g. an artery) and then dilate the hole. Thus if in any doubt, a quick test of fluid column manometry should be performed before enlarging your puncture. After placement of the small dilator/sheath is a good time for this, unless you are so worried that even this small dilation step seems unwise. Simply pulling out the wire from this set can get you out of many scrapes. Slender enough to fit into anything, gentle and atraumatic, and available without cracking open any larger kits, it’s a great aid to procedural problem-solving. Imagine this: you’ve placed a radial arterial line using one of the ubiquitous retained-wire Seldinger devices. However, after removing the needle, no flow is present. Withdrawing the catheter halfway yields good arterial flow, making it embarrassingly obvious that you penetrated the vessel through-and-through. Now you have a partially-placed catheter and no way to readvance it. The cure is simple. Fetch the wire from a micropuncture kit. With your catheter positioned to yield good flow, insert the wire, which should enter the vessel freely. Over this you can advance the catheter to the hub, after which the wire can be removed. 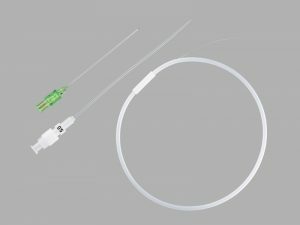 This concept can be extended to completely replace peripheral or arterial catheters by a rewire technique. However, this should be undertaken with some skepticism. Peripheral IVs and radial lines can rarely be successfully rewired; they tend to fail due to formation of a fibrin sheath around the catheter, and placing a new catheter into this sheath accomplishes nothing. Femoral art lines may do better, as will catheters failing simply due to having squirmed partially out from the skin. A caveat: under no circumstances should the wire be placed backwards (a maneuver occasionally useful with full-sized J wires). The back end is straight, stiff, traumatic, and cannot be inserted safely. Only the front tip is “feathered” for safe intravascular use. For difficult lines, you may be well-advised to start with the micropuncture set, even if bleeding is not a concern. It’s not totally clear why this is true, yet it seems to be. Some lines that seem frustratingly impossible with a conventional technique may succumb to the micropuncture. This is true for central lines, but especially true for radial arterial lines and even peripheral IVs, perhaps because of their small vessel diameter. The micropuncture needle is small, precise, and very sharp. The tip is usually quite echogenic. Particularly if used without an aspirating syringe, it is maneuverable and dextrous. The wire is usually straight, with a soft but non J-shaped tip, and may pass into tight arteries where a J would hang up. When placing peripheral and arterial lines, use the microneedle and wire, but not the dilator; simply railroad the desired catheter directly over the wire. (There is sometimes a bit of resistance and discomfort, but with patience and some gentle twisting pressure it should pass.) Dilating these vessels, particularly arteries, is unnecessary and perhaps unsafe. In austere circumstances, you can consider placing the sheath and leaving it as a “midline,” but leaving such a stiff device in place for many days is hard to recommend. The needle is thin and bends easily. Careful advancement through tough skin, and perhaps a two-handed technique, can help place it without deformity. This can also be a problem if performing a landmark-guided subclavian line, a situation already fraught with needle-bending potential. Confirming intravascular placement is complicated by the small needle; aspirating blood will be slower and have more resistance than a larger needle. Expect this. Be careful dumping these kits onto your sterile field. For whatever reason, they have a particular habit of scattering themselves everywhere. If you don’t have access to these kits, advocate for them. If you do, start incorporating them into your game. They are a flexible, multi-purpose rescue device and force multiplier that will make many procedures possible that would have been impossible, and others easy that would have been hard. All hail the mighty micropuncture.